CTC are hosting a series of talks on various aspects relating to Tri…these are for the benefit of members to help improve training/fitness/fight injury etc. Trevor is employed full-time as UCC Exercise Physiologist, testing and advising athletes and players in all sports including triathlon. Competing in triathlon since 1989, he has won multiple national titles in all distances from sprint to half-Ironman. 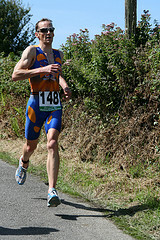 Former holder of Irish Ironman record in 2007 of 9hr 18 min. Also a keen interest in cycle racing, swim races, cross-country and adventure racing. Learn from his knowledge, experience and outstanding results! Tea/coffee will be served in the New Bar in the Student Centre afterwards.